"THANK YOU FOR PROTECTING OUR COUNTRY"
" I look forward to a great future for America. "Green = Army" "Dark Blue = Navy" "Light Blue = Air Force" "Red = Marines"
It's PCS season. For military families, a summer PCS move can prove to be a hectic time if not planned properly. A recent study¹ conducted by the Department of Defense shows from the 520,000 Service Members who moved in 2018, over 40% moved during the “peak season” (May 15 – August 15). 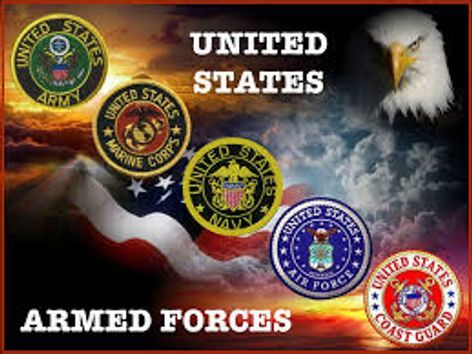 There are Twenty-Five Million living Americans have served in the United States Armed forces. 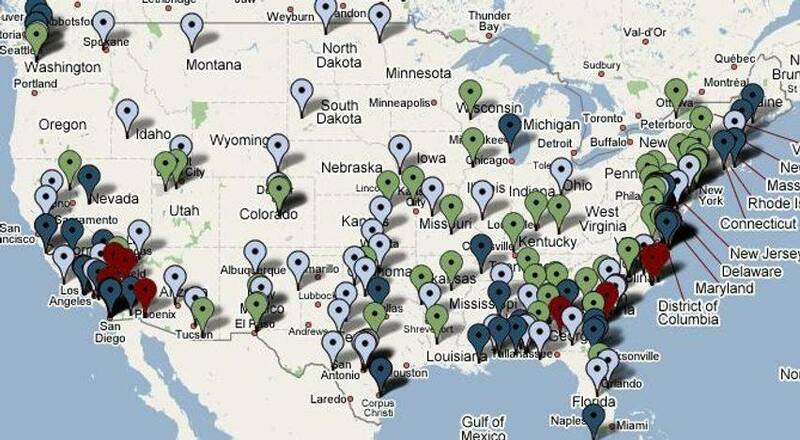 They represent a huge portion of the United States population. Whether Active-Duty, Veteran, or Retired they all share a common comradeship forged under the most challenging circumstances in their lives. Those insights are the most powerful bonds in their belief system and drive a devotion that shapes decisions in their daily lives. This insight is a core driver of the Military Veteran affinity group. Depending on the need, Military Veterans represent a powerful audience to drive client success. According to the National Association of REALTORS®, 21% of all home buyers and sellers are Veteran and Military Service Members. These customers conduct 650,000 + transactions per year, worth over $153 billion. This includes numerous moves into new areas where they have no existing connections. By establishing yourself as a leader and advocate in the Military community, you gain access to the most active network of referrals and Real Estate transactions across the nation. The VA Loan benefit is the best chance many Military Service Members and Veterans will have to own a home and in many cases, you will likely be informing a client about benefits that they don’t even know exist. Help those who defended our country with the most important purchase of their life. Brian Adams has proudly served five years in the Army, with one deployment to Afghanistan in 2011–12. But while serving his country, Adams managed to find time for a side pursuit: He also invested in real estate. "I bought five homes in five years," says Adams, 31, who currently resides in Fort Hood, TX, in one of the homes he owns. Meanwhile, he rents out the four others, all of which he once inhabited during his various deployments. How did he get started? As an undergrad at West Point, Adams recounts how his economics professor would tell his class how he'd buy a house every time he changed stations, then turn it into a rental once he had to move.“That inspired me to do something similar," says Adams. In 2009, at the age of 22, Adams purchased his first home while stationed in Fort Sill, OK. A year later, once he moved to Fort Hood, he bought his next place, paying his first mortgage with the rental income from his first house. Every time he moved, Adams repeated that pattern, explaining, "I loved it so much that I left the Army to become a real estate agent." Now he helps other military personnel follow in his footsteps. "I highly encourage military to consider buying homes as an investment," Adams says, adding that he wishes he'd had more guidance starting out. "I wasn't investor-savvy when I purchased my first homes," he explains. "I wish I knew what to really look for early on." Should Active Military Buy Rather Than Rent A Home? Because Military personnel have to move frequently (often every three years), it can seem intimidating—and financially impractical—to buy a home. As a result, although 64% of Americans own their home, only 38% of Active-Duty service members can make that same claim, according to Military.com (the remaining 40% rent off base and 22% live in Military housing). Yet as Adam's story proves, owning and even investing in Real Estate can be done—even while on Active Duty—and be an appealing option for a growing number who want to take steps to secure their financial future. "Many Active-Duty families choose to buy a home at a duty station, with plans to either sell it when they leave or rent it out," says Amy Bushatz, Military Spouse and Family editor for Military.com. Plus, since many troops return several times to the same duty station, owning Real Estate gives them a home to come back to later. "Some families also find themselves stationed in an area they grow to love and hope to call home after retirement," Bushatz adds. "By purchasing a home there and then renting it out if they need to temporarily move away, they create something to look forward to once they leave Active Duty." 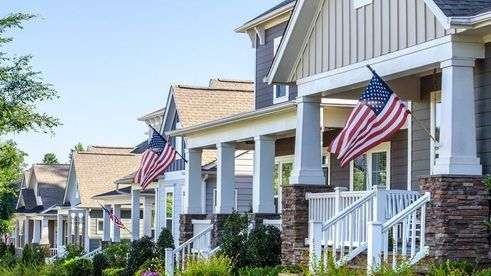 In an effort to encourage Military personnel to purchase homes, the U.S. government has a number of financing options to help out—starting, first and foremost, with the VA home loan. The Veterans Affairs home loan program offers loans to both Active and Retired Military at competitive interest rates, with no down payment or private mortgage insurance. That's a bargain compared with the usual 20% down payment and other expenses faced by Non-Military homeowners. Furthermore, Active Military also receive a Basic Allowance for Housing, a nontaxable monthly stipend that can be put toward renting a home or paying a mortgage. To determine the BAH amount, the service member's rank and dependency status are first taken into consideration. Then, because the price of homes varies greatly throughout the country, the BAH varies from state to state as well, generally providing more funds to personnel stationed in more expensive areas. For example, a Private (the lowest rank of the Military) based in San Francisco would receive $4,200 per month with dependents, or $3,150 without. A Soldier with the same rank in Johnstown, PA, would receive $774 with dependents, or $591 without. Put the VA loan and BAH together, and buying a home can often be realistically within reach. So what if a deployment forces you to pick up and move to a new state, or continent? It's entirely possible to hold onto the house and turn it into a rental with the help of a property manager—someone hired to stay on top of maintenance, rent collection, and other landlord-related issues for a portion of the rent amounting to anywhere from 4% to 12%. Army Capt. 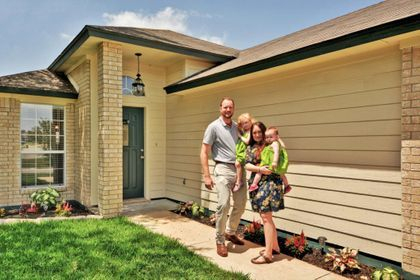 Logan Lee learned the importance of a Property Manager after he bought a duplex in Fort Hood. "I lived in one side and rented out the other," says Lee. Only shortly after moving in, "I received orders to deploy to Afghanistan, so I rented out both sides." At first, Lee tried to manage his duplex from afar. "Only with the Military lifestyle and work demands, it is very hard to do a good job," he admits. So he hired a Property Manager, and is very glad he did. "For me, having a Property Management Company was huge," he says. "That way, I could focus on my job, and touch base every now and then with the management company." While investing in Real Estate may seem intimidating, resources abound for novice investors. Adams found support and guidance at Real Estate investment site Bigger Pockets. Lee also says that being in the Military gives you a leg up in terms of being seen as someone that Contractors, Management Companies, and other Real Estate Professionals can trust. "They'll take you more seriously and trust your word without having a prior relationship," says Lee. "I was young getting started, and I think being in the Military helped when I met with Real Estate Professionals who had been in the business for decades." Can you cover a mortgage with your BAH? Are you willing to hire a Property Manager and rent out the home when you no longer live there? If you decide to eventually convert your owner-occupied home into a single-family rental, would the rent cover your mortgage and fees so you can move on to using your BAH to rent or buy a home in your new locale? Once you're ready to take the plunge, make sure you’re in the right hands with a Veteran-Friendly Real Estate agent, and consider all of the costs associated with this important investment. For more advice read this Veteran's Guide to Home Buying. Announcing a new product, service or newsworthy event? If you want to announce a new product, service or event, we will draft a Press Release and immediately get your news found on all major search engines and social media networks by using a Press Release distribution service, EIN newswire. Social media has changed how people communicate around the globe. It's led political revolutions and even created pop culture phenomena. As businesses scramble to figure out how to harness the power of social media to reach new audiences, a familiar marketing tool—the Press Release—has now gained fresh purpose. 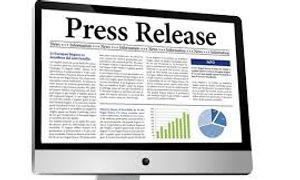 Press Releases have become a vital tool and more important than ever in successfully promoting your company. Find out how you can leverage press releases and specific content to help investors, customers, potential employees and other target groups learn more about your company. Announcing a new product, service or event. 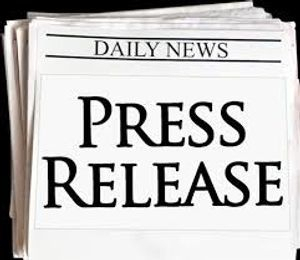 If you want to announce a new product, service or newsworthy event, we will draft a Press Release for you and immediately get your news found on all major search engines and social media networks by using a Press Release distribution service. This also enables you to target thousands of journalists. Improving brand image. Because it has become so easy to publish and distribute a Press Release, we can easily send out as many Press Releases as you want. Publishing more Press Releases more often is a good way to improve your professional image. Instant world-wide distribution. Before online Press Releases had became common, most Press Releases were sent only to journalists. If not deemed worthy of press mention, they lived in a binder, on someone's desk or in a building lobby. Now a Press Release can be distributed to millions of people around the world instantly through email and social media. Viral possibilities. An online Press Release can go viral if people start sharing it over social media networks, thereby creating a buzz that was never possible with traditional Press Releases. Search engine optimization. By using specific keywords relating to your business, we optimize your Press Release so people can easily access your information through search engine use. 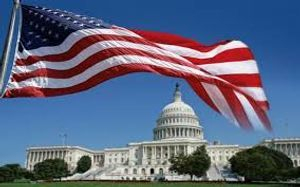 People say that the American language is one of the most difficult to learn because we use so many slang words and abbreviations that only we understand. The military community has its own language within that, and especially favors acronyms. PCS, LES, BAH, AWOL, PT, FTX…the list is never ending, really. If you’re in the market to buy, sell, or rent a home and are looking for a professional to help, you’ll likely go to Uncle Google and find thousands of Realtors who are all #1 and eager to help you. For just a moment, I will abandon my speech about the importance of choosing a Realtor by personal referral and accepting only excellence for your representation. So let’s try what stands out…acronyms! We have NAR, SRS, ABR, CRS, GRI… and now MRP. The good news is that MRP can serve as a beacon for you to identify a Realtor who genuinely “gets” that a military move is much different than a civilian client's move. I was privileged to contribute to the National Association of Realtors creating this certification program for a “Military Relocation Professional” in 2013. And while it doesn’t guarantee the agent is absolutely amazing or has even done a DITY move, it does signify an agent who has dedicated some extra time and money to try and understand your needs (and is committed to the Realtor Code of Ethics). me start with one of the biggest a-ha moments that buyers and renters have--your Realtor’s services and representation are usually free to you (covered by the seller/landlord). And I always say, if someone else is going to pay for you to have a doctor or attorney, wouldn’t you hire the absolute best? That local MRP Realtor should be familiar with the best location for your preferred commute, schools, type of home, and budget in an area where you may be totally unfamiliar and have zero time to research. They should be your boots on the ground. You have enough to worry about; why not make one friend who is an expert where you are moving and speaks your language? As of right now, there are 10,300 MRP’s nation-wide. How do you find one? Check the MRP Directory, where you can search the “find an MRP” tab by location or agent last name. But being truly successful in today’s marketplace requires using the entire available PR toolbox. 1) Opinion Research — To help win approval from communities and government. It used to be that the biggest barrier to development was earth, water and nearby surroundings, but now it’s public opinion, politics and the potent outrage industry. Public Relations professionals are your antenna, conscience, and voice and the are key to the approval process. Public opinion research will help make the public and political landscape clearer, shape messaging, and energize the silent majority who often remain on the sideline during the approval process. 2) Market Research to help understand the marketplace and your customers – including their needs, wants, desires and fears. To be understood, you first need to understand. 3) Community Relations And Corporate Social Responsibility — which will help significantly with winning approvals, building brand and reputation, and foster a deeper, broader customer base and more referral sources. 4) Social Media And Content Marketing Are Public Relations. Neither is solely about technology; both are about developing compelling content that drives engagement. Successful Real Estate Professionals realize the full power of engagement. 5) Every Real Estate Professional Knows That Online Is THE place to be, and public relations should be utilized to drive SEO (Search Engine Optimization). Google rewards those online sites that are compelling, engaging, informative and insightful. Public Relations professionals are skilled storytellers and content generators and should be a part of all SEO-related initiatives. The future of SEO is not in technology; it’s in the ability to tell stories that readers and Google will find interesting. And that’s Public Relations. 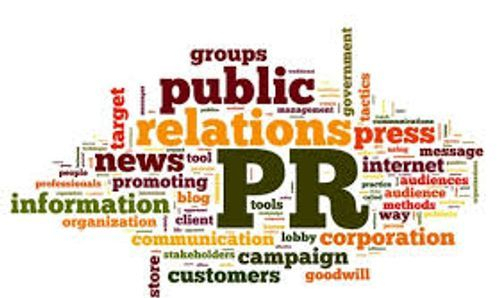 6) Publicity And Media Relations, staples in the Real Estate marketing mix, continue to be immensely important and help drive marketing and social media activity. 7) Crisis Communications planning is no longer a luxury for major corporations. Every organization — particularly those serving multiple publics — should have a “Plan B” and be ready to address the question “What if?” And now, more than ever, Real Estate may involve complex litigation that requires effective legal and Public Relations counsel. 8) Media And Presentation training to ensure spokespeople and salespeople are on-message and can handle difficult questions. 10) Strategy, Counseling And Reputation Management … because Real Estate goes beyond the transaction. As Warren Buffett said, “It takes 20 years to build a reputation and five minutes to ruin it. If you think about that, you’ll do things differently.” . In the end, Real Estate goes beyond bricks and mortar; people buy with their heads and their hearts, so trust is essential. Real Estate transactions, big or small, are often complex, involve multiple parties and are shaped by emotion more than logic. 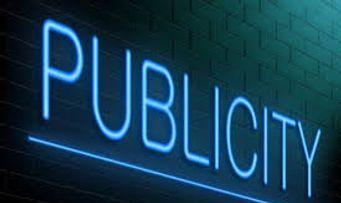 If fully utilized, Public Relations is the lone communication discipline suited to help bring parties together, build mutual understanding and make deals happen. The home-buying journey can be uncertain, full of twists and turns you don't see coming. Even if you're using a Veterans Affairs loan—and taking advantage of the unique benefits that come along with it—you could still run into some big roadblocks along the way. That's why you need a savvy Real Estate Agent to guide you. And while any agent technically can help with a VA purchase, an agent who’s particularly experienced with Military buyers can help you better navigate the process. From pre-approval to closing, a Military-Friendly Real Estate Agent will know what's on the path ahead, and remove any obstacles in your way so you can get the house of your dreams. Active-Duty Service Members may have to relocate often and quickly, and that sometimes means buying and selling on tight timelines. Lukavich is used to streamlining the process for her Military clients who are moving to the area, frequently performing a walk-through of homes via Skype and video for clients who may end up purchasing a home sight unseen.“The majority of my Active-Duty buyers do not have the option to make a trip in person to view the home, which puts a lot of additional stress on them,” she says. “I am literally their eyes and ears with the purchase of their new home.” And it's not just about buying—if you have to sell your home quickly, a Military-Friendly Agent can help get it done while not sacrificing on a profit. Most lenders will say they do VA loans, but those who lack experience often don’t understand the special circumstances or documentation required, says Michael Garcia, broker and owner of TQS Realty in Palm Beach, FL.“I’ve had numerous Veterans who used a conventional mortgage lender almost get denied at closing because they didn’t understand some nuance,” he says. In most purchase situations, buyers understand that they may need to make some repairs to the home after purchase to get it move-in ready—from replacing electrical systems to repairing or replacing a worn roof. But to qualify for a VA loan, the house must meet a set of VA-designated Minimum Property Requirements. While most buyers—and sometimes even agents—are focused on a homes bells and whistles, a VA specialist has an eye for spotting the red flags that might need to be addressed before a VA loan can close, from broken window panes and rotten exterior wood, to torn flooring or missing light fixtures. “If you are well-versed in MPRs, you can often tell upfront that in your professional opinion the house won’t pass the appraisal,” says Benny Dinsmore, a Realtor® with Coldwell Banker in Frisco, TX, who has 20 years of experience with military clients. Property condition problems aren't automatic deal breakers, but repairs will often need to be made to keep the deal moving forward. While you can find the list of approved properties on the Department of Veterans Affairs website, a Real Estate Agent who doesn’t regularly deal with Veterans may not know to look. “You don’t want to visit a place and fall in love, then realize you’ve wasted time and possibly money because your agent didn’t do their research,” Garcia says. The good news is lenders may be able to help buyers get an unapproved condo development on the approved list. Talk with your lender for more details. Make sure to view "Our Clients Press Releases on this page to find your qualified, experienced MRP!!! The Navy gets 14 new ships, including a carrier; the Air Force adds 56 F-35s; the Army gets 17 Apache and 11 Lakota helicopters; the Marine Corps receives 24 vertical landing F-35Bs; and the Coast Guard gets a long-needed icebreaker. All the troops get funding for a 2.4 percent pay raise that took effect at the beginning of the year, with the possibility for more next year. • $739 million for ten F-18 Super Hornet aircraft (Navy). • $676 million for eight V-22 tilt-rotor aircraft (Marine Corps and Navy). • $600 million for five MC-130J aircraft (Special Operations Command). • $577 million for 17 AH-64 Apache helicopters (Army). • $510 million for three KC-46A tanker aircraft (Air Force). • $501 million for three P-8A Poseidon aircraft (Navy). • $480 million for six C-130J aircraft (Air National Guard). • $400 million for eight MH-60R helicopters (Navy). • $387 million for eight CH-47 Chinook helicopters (Army and Special Operations Command). • $343 million for four KC-130J tanker aircraft (Marine Corps). • $250 million for two CH-53K King Stallion helicopters (Marine Corps). • $221 million for seven UH-1Y/AH-1Z helicopters (Marine Corps). • $207 million for two C-40 aircraft (Marine Corps). • $130 million for two C-37B aircraft (Air Force). • $110 million for additional RQ-7 Shadow systems (Army). • $108 million for eight UH-60 Blackhawk helicopters (Army National Guard). • $107 million for nine MQ-1 Grey Eagle vehicles and payloads (Army). • $100 million for one HC-130J aircraft (Air Force). • $90 million for 11 UH-72 Lakota helicopters (Army). • $84 million for six MQ-8 Fire Scout vehicles (Navy). • $40 million for two SATURN ARCH aircraft (Army). • $29 million for one Dash 8 maritime patrol aircraft (Southern Command). One of the most rewarding experiences that a Real Estate agent can ever have, is to assist Active-Duty Military families and Veterans buy their dream home. WASHINGTON (May 3, 2016) – Differences in household demographics and affordable financing options spur homebuying demand for young active-service military members, causing them to significantly outpace the share of non-military homebuyers under the age of 35. According to the first-ever 2016 Veterans & Active Military Home Buyers and Sellers Profile, which evaluates the differences of recent active-service and veteran home buyers and sellers compared to those who’ve never served. The survey also found that while nearly all veteran and non-military buyers and sellers use an agent, usage is practically universal among active-service military members. NAR’s survey gathered greater insight into how each population of buyers and sellers differs and is similar to those who have never served in the military. Of all homebuyers, 18 percent identified as veterans and three percent as active-military. Of all home sellers, 21 percent identified as veterans and one percent as active-military. The results revealed quite a few contrasts between active-service military buyers and buyers who’ve never served. At a median age of 34 years old, the typical active-service buyer was a lot younger than non-military buyers (40 years old) and was more likely to be married and have multiple children living in their household. As a result, they typically bought a larger home that cost more than those purchased by both non-military buyers and veterans. With the ability to obtain a VA loan, only five percent of veterans and three percent of active-service buyers said saving for a down payment was the most difficult step. Of those, only four percent of veterans and 13 percent of active-service buyers said student loan debt delayed saving. Sixty-two percent of veterans cited having other types of debt and 43 percent of active-service military referenced credit card debt. While a larger share of active-service military buyers had student loan debt compared to non-military buyers and veterans, their debt balances were typically lower. Among active-service members, 37 percent had student loan debt under $10,000 compared to 21 percent for those who’ve never served. Active-service buyers prefer large single-family homes The median income of veteran and active-service member homebuyers in the survey was slightly lower than buyers who’ve never served in the military, which was $86,500. Active-service buyers typically bought a 2,170-square-foot home that cost more ($226,000) than those purchased by non-military buyers and veterans. Veteran buyers had a median income of $84,000, and they typically bought a 1,980-square-foot home costing $220,000. Mirroring the general population of buyers, over 80 percent of both veterans and active-service buyers purchased a single-family home, with those currently serving purchasing single-family homes at the highest rate (87 percent). The primary reason for the home purchase for active-service military was job relocation, followed closely by the desire to own a home of their own. Compared to non-military buyers, veterans were more likely to want to be closer to friends and family or moving for retirement. Increased mobility means Active-Service and Veteran buyers and sellers rely on Real Estate Agents. Some of the characteristics of active-service sellers differed from non-military sellers. They were younger, far more likely to have multiple children living in their household and sold a home in a suburban area at a far higher rate. 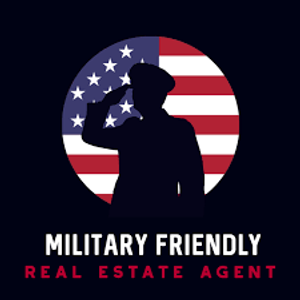 Additionally, the use of an agent was highest for active-service military sellers (94 percent), who – likely dealing with relocating to a new area in a short time-frame – cited both wanting help in marketing the home to potential buyers and help negotiating and dealing with buyers at a far higher rate than non-military sellers and veterans. Eighty-nine percent of veterans used an agent, on par with non-military sellers (90 percent). The most commonly cited reason for owners selling their home varied. For non-military sellers, the most commonly cited reason for selling their home was that it was too small (18 percent), while the most common reason cited by veterans was to be closer to friends and family (23 percent). Not surprisingly, job relocation for active-service military sellers was the most common reason for selling (43 percent). NAR is committed to educating more Realtors® about working with current and former military service members through its “Military Relocation Professional” certification program. This educational initiative available to Realtors® offers insights into finding housing solutions that best suit the needs of current and former military members while taking full advantage of their military benefits. To date, over 16,800 Realtors® have earned the certification - and growing every day. In July 2015, NAR mailed out a 128-question survey using a random sample weighted to be representative of sales on a geographic basis to 94,971 recent home buyers. The recent home buyers had to have purchased a primary residence home between July of 2014 and June of 2015. A total of 6,406 responses were received from primary residence buyers. After accounting for undeliverable questionnaires, the survey had an adjusted response rate of 6.7 percent. Eighteen percent of recent home buyers are veterans and three percent are active-duty service members. All information is characteristic of the 12-month period ending in June 2015 with the exception of income data, which are for 2014. Recognizing when certain Real Estate industry trends are coming to an end may present lucrative niche segment opportunities for growth. This is particularly the case if you have a solid idea where your targeted market is heading. One niche market to consider may include working with Military and Veterans personnel. 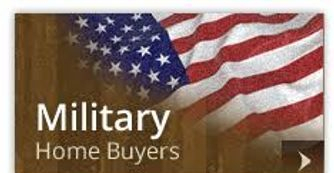 The case for the Military niche begins with a vast population of potential buyers and sellers. 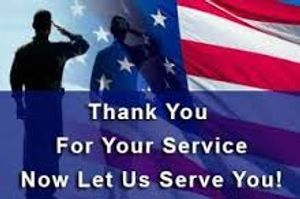 There 22 million Veterans in America and almost 1.5 million active duty Military personnel, according to data presented in a November 11 Press Release issued by the National Association of Realtors (NAR). Military buyers are also eligible for attractive mortgage packages offered by the Department of Veterans Affairs’ home loan program, which features zero-down payment loans and boast one of the lowest default rates in the country. The knocks on addressing the Military niche are abundant and have been so for some time. However, this is one of the things a forward-thinking and savvy broker should be looking for—an under-served market that is ripe for recovery under the right circumstances, many of which can be driven by Real Estate Professionals who want to serve this unique market. 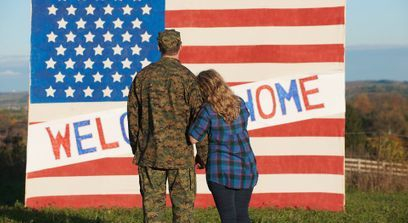 An ongoing area of concern is the transient nature of Military families who may be relocated with very little time to manage the home-selling process. This has particularly been the case for the last several years where unfavorable economic conditions forced many Military homeowners to list their homes for much less than paid cost. It is therefore extremely important for them to have a qualified Real Estate Agent to guide them. One perk to current economic conditions is that inventory is near its 30-year lows in many U.S. markets. Interest rates continue to be outstanding on the commercial market and even better when properties are financed through a VA Loan offered exclusively to Military personnel. Furthermore, the rental market continues to be sensationally-hot throughout the U.S., particularly in areas where families are routinely coming and going. That can be a selling point to any Military or Veteran home-buyer. Do this by including a rental marketing plan for Military families who will likely be moved within two or three years. Demonstrate to buyers up front how monthly rental income will cover the costs of mortgage and ongoing maintenance expenses. This is hardly a ground-breaking new business model; however, it can still be highly-effective when Military personnel purchase a home for the right price! In this capacity, Real Estate Agents can function as much more than an agent to a home; rather, they can also serve as a trusted business advisor that helps honorable and forward-thinking Military families invest in their long-term financial futures. Market Viability—do your research and make sure there is a market for Military home buyers and sellers in the communities you serve. For example, if there is a large population of Military and Veteran personnel in the communities you serve and housing prices are on the rise, then you may have very good reason to begin addressing this niche. But it is also important to remember that Veterans are everywhere. Build your Network—establishing relations with local Military Relocation officials and positioning your skills as value-added expertise will be critical to long-term success. Seek referrals from pleased customers and attend local Military events for starters. In short, show you understand and care about the unique challenges your customers face and can be a visionary and expert resource rather than just an order taker. The Military niche is not for every agent. However, those who can focus on the serving the needs of Military now will be positioned to be leaders in their markets when this trend becomes the one your peers are talking about, if they aren’t already doing so. But instead I’ll keep this short and sweet! Being featured in the Press is hands down THE most effective way of positioning yourself as an expert. And why is that so important? People want to work with experts. If you’re an expert, people will be more likely to trust you and therefore more likely to pay for your products or services. So many of the people I work with have important messages they want to share. I have clients who run social enterprises and charitable organizations who want to raise awareness. I have clients who have overcome adversity and want to share their stories to inspire others and tell people they’re not alone. I have clients who want to impart their knowledge to help others make improvements in their lives or businesses. Being featured in the press is one of the best ways of sharing your message with a wide audience. When you appear in the Press you get more eyes on your business and this inevitably leads to more sales. I had one client who signed up ten new clients after one article in the press, another whose sales went up by 200% after appearing in the press, another who doubled her book sales after just one article in the press, and another who gained new VIP clients on the back of press coverage. And if you do PR on an ongoing basis so that your business is regularly appearing in the press, just think what impact that could have on your sales! It can be so hard to get traction on social media, and building your email list can often feel like a struggle. When you appear in a publication, it enables you to reach new audiences of tens of thousands or even millions of people. (As an aside, one of my clients bagged 1000 new Instagram followers in one day after appearing in the press!) And if you’re strategic about it, you can make sure that the publications you’re featured in are read by your ideal clients, so that you’re getting in front of all the right people. For many, Real Estate Marketing is all about getting a property in front of as many people as possible, with the hope that some of those people have an interest in buying. It’s more of a shotgun approach (‘spray and pray’) than it is a rifle approach (targeted and steady), and it’s broken. The millennial audience has changed the game; traditional, outbound marketing efforts go largely unnoticed, and the ROI shows it. Digital, inbound-focused campaigns require more time and effort to set up, but the difference in ROI can be astronomical. It isn’t just millennial's, either. How everyone uses technology has evolved, so regardless of your target audience, going digital is key. The Real Estate Market is in the middle of a massive transition. This change needs to be met by a shift in how Real Estate Agents and companies market themselves and communicate with potential buyers and sellers. What does that look like? For many Real Estate Agents, it looks drastically different than what they’ve been doing for years (traditional marketing, as it were). Modern Real Estate Marketing is all about engaging your audience digitally and positioning yourself as a long-term partner through incredible content (more on all of this later). Our culture is based on on-demand, I-want-it-now, interactive experiences — hence the popularity of Real Estate Apps like Redfin and Zillow. These tools allow users to quickly find, filter, explore, and save for-sale properties in a way they couldn’t have a decade ago. Homebuyers (and sellers, for that matter) rely on the internet for every stage of their purchase decision, from finding a qualified Real Estate Agent, to awareness and then to the actual decision at the end of the journey. develop a beautiful, content-rich website that ranks well in search engines; create an engaging social media presence that includes Press Releases, blog posts, images, video tours, and Q&A posts; build an email list of potential buyers to market to in the future. Whatever digital marketing tactic you choose, the key is to know your audience and play on their playground, i.e. engage with them wherever they are. In this case, wherever there are means the internet. Your website can be a lead generation machine if you know how to use it, but the majority of Real Estate Agents are disappointed with the quantity/quality of leads coming in. There’s a disconnect here. For a Real Estate Agent’s website to become a hub for lead generation, it has to be more than the all-too-expected headshot of the agent plus a handful of images and bedroom counts; most of these details can be found via Redfin or Zillow, among others, anyway, so you need to provide something different. In general, using your website for lead generation includes optimizing it for search, developing unique and helpful content, and strategically placing forms throughout the site. As noted, there is a disconnect here. Agents are often unhappy with the leads their website generates but they don’t prioritize their website on a consistent basis. The hard truth for some: great digital marketing requires time and effort. In 2017, effective Real Estate Marketing emphasizes the website and Press Releases. Successful agents use Press Releases as an opportunity to connect with potential buyers, both those who are currently in the market, as well as those who aren’t yet, but one day will be. The best companies spend resources on unique video content and experiential content. This carries a lot of potential opportunity for today’s Realtor. While paying for advertising or premium listings still play a key role in Real Estate Marketing, the importance of online content as never been greater. Specifically, as mentioned above, agents need to speak to both in-the-market people as well as not-in-the-market-yet people, all in one place.Create an engaging Press Release that is keyword-optimized and covers the reasons why your potential clients should be endeared to you. With THOUSANDS of agents in your area, what are you doing to stand out from the pack? If someone isn’t ready to buy a home yet. but can be introduced to Your Brand through a helpful article or eBook on DIY home projects, the financial breakdown of buying VS renting, or even a ‘listicle’ of local contractors for common needs, your brand is more likely to be recalled and valued over another who only did advertising. Another indicator of why apps like Redfin and Zillow have exploded in growth, the demand for images is never going away. This isn’t anything new, either, as most real estate agents have been including photos of properties on their websites and in newspapers for years. The important takeaway here isn’t that you include photos, it’s how you include photos. When you list a property on your website, consider both the types of images you include and how you display them. Is this a slideshow? Photogrid? Are the images optimized to look beautiful on any/all devices? Are these images easy to share on social media? Email? For Real Estate Agents and companies, testing how your audience reacts to and engages with your photos is important. One of the ways you can do this is by implementing a conversion rate optimization strategy. 9%? I almost didn’t believe this one, but after doing a bunch of my own research into Milwaukee-area agents, I’m sold. The audience for home buying wants, craves, images of potential homes for them, as well as immediate answers to their questions — so why haven’t agents delivered on a consistent basis? Social media is an ideal platform for B2C institutions like Real Estate Agents because it opens the door for real-time conversation. For example, say an agent posts an album of a newly-listed home. They can also include a quick description of the property and maybe even a video walk-through. As they share this content on Facebook, the audience can review it all on their own time and devices, and ask questions directly to the listing agent (comments or direct messages, in this example). The agent could then respond directly to the user, opening the door for personal communication, and inviting them to stop by the property. In short — get on social media. Share your listings, promote blog posts, Press Releases and engage your audience. We’ll keep this one short and sweet: currently, most Real Estate Marketing efforts fall short in terms of social media. Either agents/companies post a lot and no one is listening, or they don’t post at all. And, either way, it’s a bad look. This makes sense: Homeowners want to work with an agent who will do everything they can to find the right buyer. These sellers realize that the buyer wants as much info as possible on the property, which now includes video walk-throughs (and even Facebook Live tours). Unfortunately, the data suggests that most realtors haven’t caught on to this yet, as video isn’t a core piece of their Real Estate Marketing strategy, with only 12% reporting active YouTube accounts. The demand for video doesn’t stop with YouTube, though, as agents can now use various ‘live’ services on multiple social platforms, as well as include video on their website. As a Real Estate Agent, what’s your plan after the sale? Are you developing long-lasting relationships with both buyers and sellers that you can revisit with down the road? Or, are you saying ‘Thanks!’ and moving on? The old adage of ‘it costs more to acquire a new customer than it does to retain an existing one’ is true across nearly ever industry, real estate notwithstanding. Consider how a comprehensive Real Estate Marketing plan, with the inclusion of digital, can help you develop long-term, loyal relationships — it’s a huge opportunity. This is going to look different for every agent, but the common theme will be developing a platform for your message and communications: a beautiful website tailored to your audience, a robust content marketing plan (Press Releases), meeting the needs of various audience segments in different stages of the buying/selling process, and a systematic approach digital media, from social to video. Combined, you will be able to set yourself apart in a hyper-competitive space. Many Military members have no idea they qualify for the only no-money-down mortgage on the market, but there are specially trained real estate professionals to help. REALTORS® who earn the Military Relocation Professional (MRP®) Certification are specifically trained to guide Veterans, eligible surviving spouses, and active-duty service members on how to take advantage of the numerous housing benefits of VA loans, awarded to those who serve and protect this country. "Less than 15% of veterans have taken advantage of VA loans," said Phil Riek, a real estate broker and retired U.S. Army lieutenant colonel. "There is huge market potential." There are 1.43 million active-duty service members, said Riek. Of those, 87% are in the continental United States. There are an additional 1.5 million Reserve and National Guard members and 20 million veterans, he said. With drawdowns and budget cuts, Riek says there is a growing number of service members returning to civilian life and many are eligible for housing benefits. All active-duty service members and those who have been honorably discharged are eligible for VA financing. In addition, most states and counties offer benefits like closing cost assistance and tax abatements, but those benefits go unclaimed because most people do not know they exist. VA loans require no down payment or private mortgage insurance. They also offer low-interest rates and allow a 4% seller contribution. "VA loans perform much better relative to delinquency than FHA," said Paul Marek, a mortgage originator in Florida who specializes in VA loans. "I attribute that to the Military discipline service members exude in taking care of their primary shelter." Agents who earn the MRP® Certification understand the nuances of this loan type and the demands of this lifestyle. Most active-duty service members relocate every two to three years, according to the MRP® Certification core course material. These agents know that active-duty home buyers are highly motivated, because they usually have only 10 days to search for a house. It's up to the agent to navigate the home search under strict deadline pressure. VA loans can be used to purchase a single-family home or a multifamily income property of up to four units, as long as it's owner-occupied. These loans can also be used to build a house, make repairs, refinance, and adapt the home for special access. While many veterans might think their benefits have expired or are exhausted, it's best to double-check. Your MRP® can guide you on recent benefit updates or point you in the right direction to see if your eligibility has changed. Why Should Real Estate Agents Worry About Getting Press? You do your own advertising and you can have a steady business without concerning yourself with the trouble of looking for publicity. Why should you care if you are getting Press Attention? Press = backlinks to your website. Driving crazy SEO value. Press = new social followers. Press = brand value, establishing yourself as an expert. Press = direct website traffic. Press = brand awareness, a huge leg-up for realtors. Press = leads, plain and simple. People read about you and will call. The life of a Real Estate Agent is a busy, between showings, new listings, and closing deals, it’s difficult to find the time to think about PR. If you’re a Real Estate Professional and you’re not sure if Press Coverage is something that you need, what follows will break down a few of our super simple methodologies for generating press coverage. The interesting thing, and we’re here to pitch you our services, is that it boils to relationships + expertise + grunt work. Better Search Engine Rankings – Press Coverage drives new visitors and increases traffic. The more variety of Press an Agent gets exposure from, the more they’ll see traffic come in from different sources besides just interested buyers. Other publications, businesses, or online outlets will back link to Realtors’ sites which will further improve their page ranking. 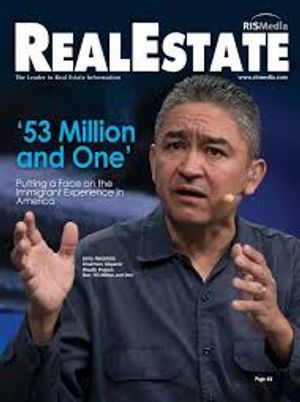 Establish Industry Expertise – Getting Press is a two-way street for Real Estate Agents and journalists. Agents who are interviewed or contribute to news stories on the local housing market, the current financial climate, or market trends become known throughout the community as an industry leader or a Real Estate specialist. The more they’re willing to contribute inside information, the more Press they gain. Buyers will become familiar with Realtors’ names and will start to seek them out when it comes time to buy or sell. Online Exposure – Press Coverage and social media go hand in hand, so when an outlet publishes a story on a Real Estate Agent they are exposed to that outlet’s followers, helping to grow an agent’s own list of followers and subscribers. Agents rely on these social contacts for networking and finding potential new clients. 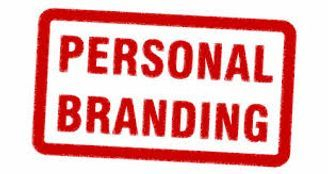 Develop A Personal Brand – Personal branding takes shape when a Realtor can show off multiple sides to their career and personality in everything that they do. 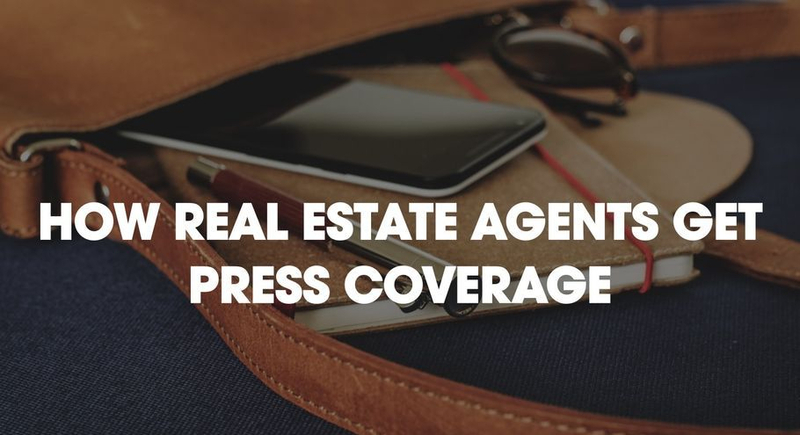 Press adds another layer to an Agent’s image in whatever niche they want to position themselves in, whether it’s in high-end listings, Military, character homes, or the condominium market. Being Newsworthy – Have inside knowledge on the market or Real Estate Trends that you see makes all the difference when trying to pitch a story to the Press. Real Estate Agents should ask themselves why the story would be relevant to readers before pitching the story to reporters. Pitching Their Story –It’s critical for Real Estate Professionals to actively seek out reporters who are willing to write about them and give them the coverage they need to build their career. Hone in on who the most relevant journalists are in the Real Estate Industry and approach them with well-thought out pitches that are too good to pass up. Real Estate Agents must do their homework on reporters that may be interested in a story and reach out to them directly. Responding To Source Requests – When Real Estate Agents take an active role in participating in journalistic stories as sources, they are making themselves known among the Press and opening themselves up for future opportunities. Getting Press as a Real Estate Professional is clearly beneficial for Realtor’s Brand, however; creating the right story or making a connection with a journalist at the right time isn’t always easy, especially when juggling a busy career that involves working around the clock. For many Real Estate Agents, the best choice is to reach out to a PR specialist for help in getting the Press they want without the work. Tapping into seasoned PR expertise lets Realtors enjoy every potential benefit of increased publicity that they can leverage to create lucrative opportunities for more listings and more properties sold. If You're Looking For A Great Way To Stand Out As A Stellar Certified Military Relocation Professional, You've Come To The Right Place. 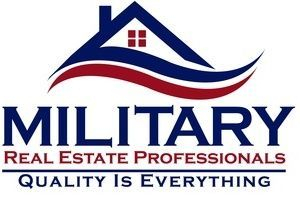 Military Real Estate Professionals Provides Everything You Need As An MRP To Help Transform Your Online Presence And Image To That Of An Experienced Expert In Military Home Buying And Selling. 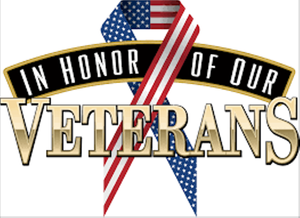 Assisting Our Beloved Veterans And Active-Duty Military Families In Their Real Estate Transactions Is An Honor And Privilege As A Real Estate Agent. 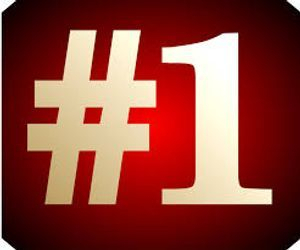 We Are Here For You To Be The NUMBER ONE MRP In Your Service Areas!!! If you are planning on relocating, you need things to move FAST. You need a Real Estate Agent who understands your needs. 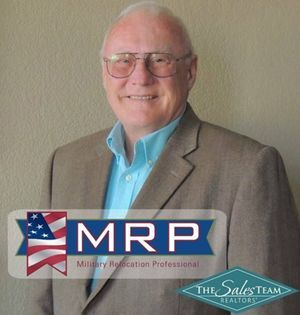 A Certified Military Relocation Professional (MRP). If you are coming in, you need to find a home that suits your needs ASAP. If your PCS orders have you moving away, you may need to sell your home ASAP. Military personnel have special needs that civilians just can’t understand. Home hunting is often done from a distance and selling negotiations may have you communicating with your Realtor® from remote locations. You want a Real Estate Agent who has the level of expertise that is superior when dealing with Military families and Veterans. Finding a Realtor® with expertise in working with Military personnel can be a challenge. Things have to move FAST when you receive your PCS Orders. We have assembled the best-of-the-best Certified Military Relocation Professionals (MRP's) here on this website. 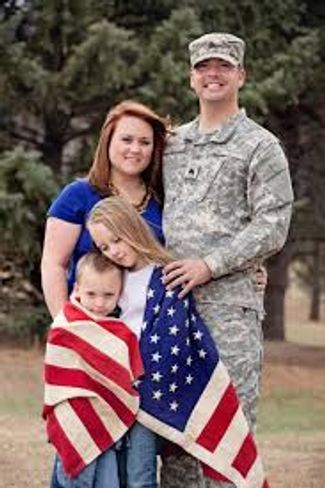 Our clients have been vetted and are committed to serving Military families and Veterans that far surpass most of the thousands of Real Estate Agents in their coverage area. For Real Estate Professionals who work in areas with a strong Military presence—either Active Duty, Retired, Reserve or National Guard—the National Association of REALTORS® (NAR) Military Relocation Professional (MRP) certification can give them a leg up on the competition. For Cindy Jones—an associate broker with Integrity Real Estate Group in Alexandria, Va.—whose primary focus in the Northern Virginia area includes the Pentagon, Fort Belvoir and MCB Quantico, NAR’s MRP Certification is vital. Impressed with the MRP class, Green says it provided him with a strong set of tools that, when combined with his background, helped him increase his business as he’s been able to guide hundreds of families through a smooth home transition. For more information, please visit militaryrelocationpro.org. How Will A Press Release Benefit My Business? Dollar for Dollar, Press Releases Beat Advertising! Dollar for dollar, you will never match the return a well-produced Press Release creates compared to advertising or marketing dollars you spend. Six or eight Press Releases can routinely create the equivalent traffic and customers of purchased ad space that could cost $5,000 or more. These aren't inflated numbers:a single newspaper ad , say half a page, can run $1,000 or more in any reasonable sized city…much more in a large market like Chicago. When properly distributed to the media, professional Press Releases pack a lot of power with far less cost. Potential clients and existing customers, not to mention vendors and partners, trust what is said in the news media about a company — and they tend to distrust advertising by that same company! By getting in the news, you establish credibility that greatly exceeds any paid marketing message. There simply is no advertising venue that equals the credibility and legitimacy of the legitimate news media. Every business advertises at some point. But few ever do a serious Press Release blast with a well-written professional news release…and fewer still. Keep at it and turn it into an on-going campaign. So, relatively speaking in most local markets, the competition is not large at all. 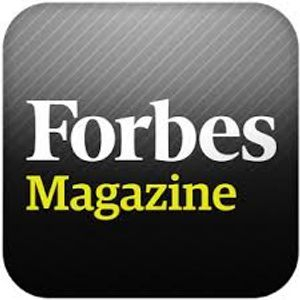 Never before have the online media been more effective than when it comes to Press Release Distribution. As the public rapidly moves online, they expect to see most of their news online too. Not just national, but regional and local news as well. They expect to read about local businesses and form opinions based, at least partly, on those same stories. If you are using a free or low-cost Press Release distribution company, you are paying for your Press Release to be posted on a website. A large proportion of the Press Releases on these sites are not newsworthy and are written in a marketing that turns off the media. 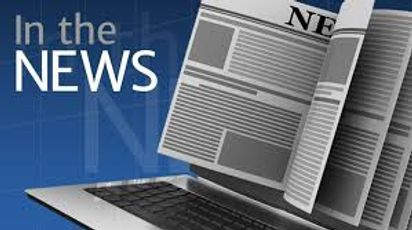 To be successful your news release must be 'news worthy' and written as a reporter/journalist would write it, not to sound like a hyped-up advertisement! Paying a reasonable fee to have the news releases written in the proper and using the right 'angles/hooks' is extremely important. Offline media journalists aren't interested in Press Release spam. Buying a media database and distributing the Press Release yourself will yield little response (and might find your company's emails being permanently filtered to the trash or spam folder). Targeting your message to the proper journalists is the trickiest part of the . Because journalists are overworked, they often visit just one or two sources of Press Releases. As a result, they go to the largest source of newsworthy Press Releases: PR Newswire or Ein Presswire, which are the oldest and largest newswires of Press Releases. If your budget will allow, this single source can be more effective than any other, and placement with them will usually make a big difference in results. 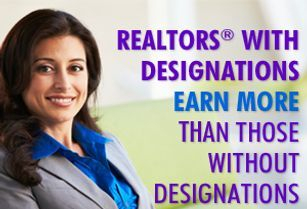 The National Association of Realtors® (NAR) and its affiliates offer Designations and Certifications for a wide range of Real Estate Specialties. Earning these Designations and Certifications helps members to increase their expertise and marketability, giving them a professional advantage. The problem with Designations and Certifications is that Real Estate Agents don't use them properly. Agents plaster them all over their business cards, flyers, web site, and email signatures, but their main marketing target - the consumer - has no idea what the Designations and Certifications mean. In most uses, they appear as "Real Estate Jargon" and detract from the agent's marketing message. Whether you are being interviewed live or online from someone reading about you there are always some things you will want to cover especially if they benefit you as an agent to do so. One of the biggies is time in the business. Many consumers will ask how long you have been selling Real Estate. This is as common a question you will get. Of course if you are a Veteran Realtor you will want to say so! Production level is another big one to cover. Everyone loves to work with a winner!!! If you have a track record for success you will definitely want to emphasize that. If you are one of the highest producing Realtors in your company, town or even the state this is something you should make people aware of to make their selection process easier. 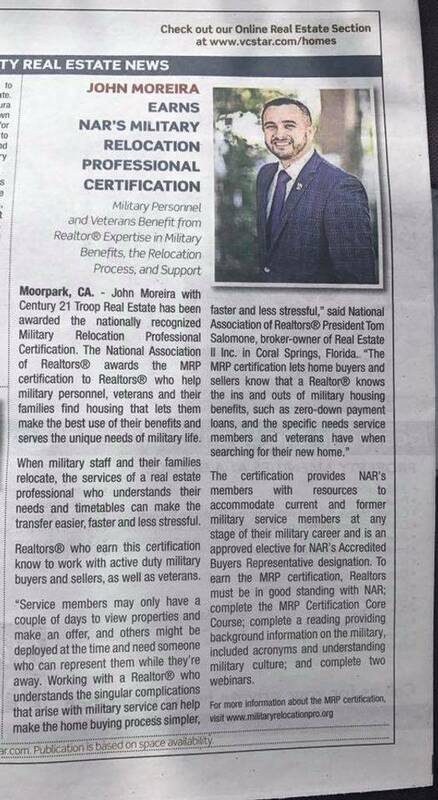 AS A CERTIFIED MILITARY RELOCATION PROFESSIONAL, (MRP) YOU NEED TO PROMOTE YOURSELF MILITARY!!! 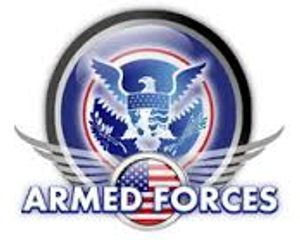 Once again, the spring and summer months herald the busiest move season of the year as hundreds of thousands of Air Force, Army, Marines, Defense Department and U.S. Coast Guard servicemen and women receive orders to new assignments across the nation and worldwide. The period of May 15th through August 31st is the annual peak move season. More than 65 percent of Military moves occur across the U.S. during peak season. Limited time and access to information on your next city can make it difficult to decide where to live, whether to buy or rent and if on-base communities will better serve your needs. When it comes to these considerations, a Real Estate Agent familiar with Military relocation can make a world of a difference. The National Association of Realtors has a special certification – Military Relocation Professional (MRP) – for Realtors trained to work with Military service members and their families. Realtors with this designation are familiar with the limitations Military families face when searching for a new home, and they can serve as a resource to fill those gaps, says Jim Lawrence, a Realtor and instructor for the MRP certification in Birmingham, Alabama. “The Realtor’s knowledge of the market area is vital, even though the Military members know the process because they do it so often. What they don’t know are things like local transportation patterns, shopping districts, schools, recreational areas, things like that,” Lawrence says. The right Real Estate Agent won’t just know the local market – he or she will also be well-versed in the Veterans Affairs home loan process and how it differs from conventional or Federal Housing Administration mortgages. A VA loan-savvy Real Estate Agent who is experienced working with Military members and Veterans is exactly what they need. They can make this an easy process so that there’s no hesitation in using the VA loan benefit. The VA loan benefit is an earned benefit for the service member – it’s something they’ve sacrificed to qualify for and it’s important that Real Estate Agents honor that sacrifice and that commitment to our country by serving them through the VA home loan. Real Estate Agents cannot sell homes or properties if they do not have clients. Thus, a Real Estate Professional’s number one need is to find new clients and really build the right image for them and their business. This means understanding the power of the Internet. Few people today find listings in newspapers or by signage alone. Instead, more consumers today go online to look for property listings, read up on Real Estate Agents and make buying decisions. Real Estate Agents who create a strong online presence will be ahead of the game and increase the pipeline of new business. Websites help Real Estate Agents build their reputation and brand. After all, people today want to work with experts in the field. It is important that a website is easy to navigate, attractive and has high-quality images and text. It's also very important that you promote your website. Smart Real Estate Agents will hire professional web designers to help them create a site. 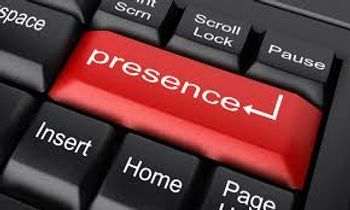 A strong online presence can increase search engine rankings and web traffic as well as create word-of-mouth buzz. Social networking websites like Twitter, LinkedIn, Facebook and Instagram help Real Estate Professionals communicate with consumers, post images and information about new properties for sale, and give people real-time information. Using these social networks, Real Estate Agents can generate a lot of great prospects online. Quick communication keeps a Real Estate Agent’s listings fresh and can lure in new clients. Smart professionals should not only post about available properties and showings but also relevant local articles and media. Another way to lure in new clients online is to make sure that a Real Estate Agent is mentioned in Directories, related websites and even on websites like the Better Business Bureau and review sites. Consumers want to work with experts who are referenced by other websites and groups. Real Estate Professionals who want to build a strong online presence need to link to other websites. This is a chance to connect with the local newspaper’s website, advertise and increase link building. Such collaboration helps improve name recognition and a realtor’s reputation in and outside of the community. Smart Real Estate Professionals use the Internet to build their image. Over time, happy clients will discuss their experiences online, which can help convince other people to use the agents. Social networking websites are changing how Real Estate Professionals can market themselves as well as available properties and the latest Real Estate News. In time, interest and credibility will increase and a Realtor can build their brand, find new clients and increase sales. REALTORS® who earn the Military Relocation Professional (MRP®) Certification are specifically trained to guide Veterans, eligible surviving Spouses, and Active-Duty Service Members on how to take advantage of the numerous housing benefits of VA loans, awarded to those who serve and protect this country. "Less than 15% of Veterans have taken advantage of VA loans," said Phil Riek, a Real Estate broker and retired U.S. Army Lieutenant Colonel. "There is huge market potential." There are 1.43 million Active-Duty service members, said Riek. Of those, 87% are in the continental United States. There are an additional 1.5 million Reserve and National Guard members and 20 million Veterans, he said. With drawdowns and budget cuts, Riek says there is a growing number of service members returning to civilian life and many are eligible for housing benefits. VA loans require no down payment or private mortgage insurance. They also offer low-interest rates and allow a 4% seller contribution. "VA loans perform much better relative to delinquency than FHA," said Paul Marek, a mortgage originator in Florida who specializes in VA loans. "I attribute that to the military discipline [service members] exude in taking care of their primary shelter." Agents who earn the MRP® Certification understand the nuances of this loan type and the demands of this lifestyle. Most Active-Duty service members relocate every two to three years, according to the MRP® Certification core course material. These agents know that Active-Duty home buyers are highly motivated, because they usually have only 10 days to search for a house. Millennial Veterans and Military members are helping fuel the resurgence of the historic VA loan program. 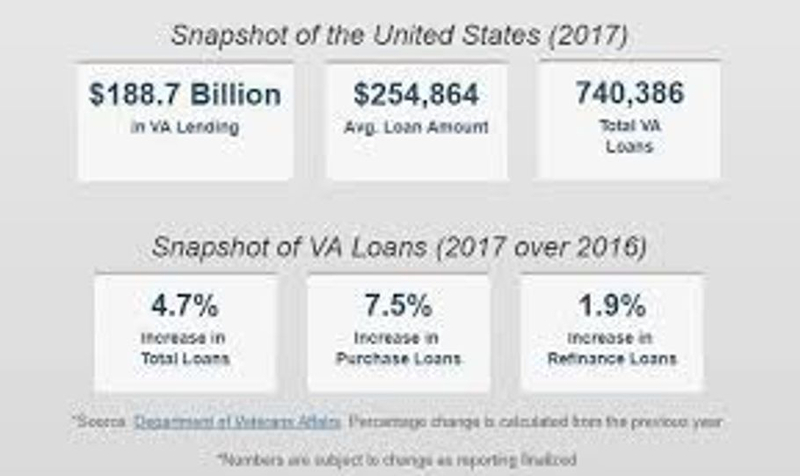 Last year’s 700,000-plus loans were more than double the Veterans United agency’s total from five years ago. Younger buyers in particular have flocked to these government-backed mortgages during a time of tight credit and flat-lining wage growth. The VA says millennials accounted for about a third of all VA loans last year. These low-interest loans offer qualified buyers a wealth of benefits. That’s especially true for millennial borrowers, who often have dented credit or minimal savings. This $0 down payment loan program was created to help level the playing field for those who serve our country, and it’s still doing so today. “VA loans offer an extraordinary opportunity for Veterans because of lower interest rates, lower monthly payments, no or low down payments, and no private mortgage insurance,” said Jeff London, director of the VA home loan program. Here’s a closer look at three of the big benefits that make VA loans such a good match for millennial home buyers. This renowned benefit of VA loans helps Veterans purchase without having to spend years saving for a down payment. When determining affordability, qualified buyers in most of the country should know that they can purchase a home for up to $424,100 before having to factor in a down payment. That ceiling is even higher in costlier housing markets. The average VA loan last year was for about $253,000. Getting a conventional loan for that amount often requires a down payment of at least $12,000. FHA loans require at least 3.5% down. That’s no small sum in either case, particularly for younger Veterans and Military families. VA buyers also don’t have to pay extra each month for mortgage insurance, a common feature of low-down-payment loans. Conventional buyers typically need to pay for private mortgage insurance unless they can put down 20%. FHA loans come with both upfront and annual mortgage insurance premiums. For example, FHA buyers shell out an additional $140 per month for mortgage insurance on a typical $200,000 loan. That extra outlay can limit your purchasing power, as well as put a hole in your monthly budget. Most VA buyers encounter a funding fee that goes straight to the Department of Veterans Affairs. Veterans and Military members can finance this cost over the life of their loan. Borrowers who receive compensation for a service-connected disability don’t pay it at all. VA loans were created to boost access to home-ownership for Veteran and Military families. They’re naturally more flexible and forgiving when it comes to credit underwriting. Lenders typically have lower credit score benchmarks for VA loans than for conventional mortgages. The average FICO score on a VA purchase last year was 50 points lower than the average conventional score, according to Ellie Mae. Compared with conventional borrowers, qualified VA buyers can also bounce back faster after a bankruptcy, foreclosure, or short sale. Having a place to call your own—whether you’re going to be there for four years or forever—is an essential part of the American dream. The U.S. Department of Veterans Affairs offers plenty of great programs to help those who have served in the Military get there, but the process isn’t foolproof. People can (and do) make mistakes buying their first home, second home, or 10th home. If you’re getting a VA loan, make sure you work with a Realtor who understands the process.“I see a lot of people go with an agent who doesn’t understand the VA system,” says Katie Fraser, a Realtor with Trident Realty Group Northwest in Seattle. “The VA won’t underwrite [just] any house. It is a huge, huge, huge deal to use an agent who understands the VA system, the VA appraisal process, and what that all really looks like.” When you’re buying through the VA, you’ll need to find a home that meets VA property requirements. A VA appraiser will have specific criteria; for instance, fixer-uppers (and even some newer homes) won’t qualify. Save yourself the headache of making an offer on a house that may not get approved, and work with a VA-experienced Realtor from the start. Veterans have access to arguably the most powerful mortgage option on the market, but about one in three home-buying Veterans don’t know they have a home loan benefit, according to the VA. When you first meet with your lender, be sure to discuss your Military status so you can be informed about all the potential advantages. One of the biggest benefits you’ll get with a VA loan is the ability to buy with 0% down (yes, we're totally serious). VA loans also come with low-interest rates, don't require mortgage insurance, and have more forgiving credit requirements. "Veterans should ask their lender if they offer any incentives for Veterans," adds Alissa Gerke, broker and owner of Select Realty Group in Columbia, MO. "I’ve seen lenders waive appraisal fees, offer a waiver of origination fee if the Veteran has a certain credit score, or other lender credits." That's right—pretty much everything will get easier as soon as your lender knows your Military status, so speak up! 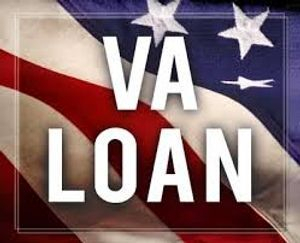 While you'll have a ton of financial advantages with your VA loan, you will have some costs to deal with. “Probably the biggest mistake I see is Active-Duty Members coming into the home-buying process and not knowing there are other costs and fees necessary for buying a home,” Fraser says. When you’re buying a home, you’ll likely have to plunk down a bit of cash for things like a home appraisal and inspection. It might not cost much in the large scheme of things, but it'll help speed things along if you come prepared knowing what you'll have to shell out for. Maybe you think there's no sense in buying if there's a chance you might be relocated in the next few years. But that doesn't mean you shouldn't buy; in fact, that home could end up being a smart investment. By searching in high-demand areas or choosing a popular home style and size (like 1,500 to 2,000 square feet), you’ll give yourself a better chance at resale if you need to move later. Or, you can hang on to it and rent it out. “My clients and I often go out and look for their first rental home, not just a home for their family," Fraser says. "With so many in transition, they’re able to purchase a home and it becomes an investment property for them when they go on to their next duty station or they move.” Don’t like the idea of becoming a landlord? A VA loan is assumable (meaning you can transfer the loan and the property to another Vet), or you can just sell the home to a nonmilitary buyer. And don’t forget: You can use your VA home loan benefits again and again, so you can own a rental property and a new home. Once you’ve found a home and your offer is accepted, you’ll probably be excited to just move in already and make it yours. Maybe you have an eye on a new big-screen TV, and you're looking into financing a new living room set you love. But don’t do that yet. “Opening a line of credit or making a big purchase after loan approval is a common mistake,” Gerke says. “This can oftentimes change the Veteran's credit score and make them ineligible for the loan.” Wait until after closing to make any other financial moves, just to be on the safe side and to keep your loan on track. Customers connect with businesses when they identify with their stories. Everyone loves a story. While it’s unlikely that your products or services are genuinely unique, your story is, and that’s what will resonate with your customers. Your story, then, is the ideal factor to differentiate yourself from your competitors. If you aren’t telling a compelling and interesting story to your audience it’s very difficult to differentiate and get people to pay attention. Your story tells your customer or potential customer why you are in business, why they would want to engage your service. It’s more than the facts - it’s the personality of your business and the experience you are offering beyond the day-to-day transactions. It’s telling them what’s at the heart of all that you do. Storytelling is all the rage. More and more brands are comprehending the power of stories to transform their presence and identity. How does such a story create that trusting feeling that customers crave? To read a story is to feel an experience and to synchronize our minds with the subject of the story. People trust other people. The core reason why your story should be personality-driven is so that it will provide someone real for customers to trust. Careful customers are asking “Why should I buy from you?” If you can answer that question with a real story, then you’ve built the trust of that customer. 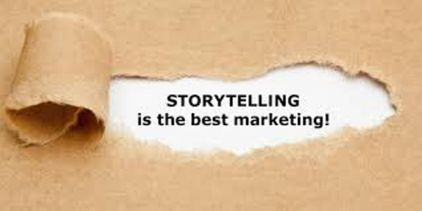 The story must connect with your customers. So taking these established definitions into account, it becomes clear that establishing your Real Estate Brand is the process of communicating effectively and consistently a relevant message over time so that you will (eventually) elicit the desired emotional response whenever your name is seen or heard by your target audience. Now let’s delve further in and lay out some fundamental steps you should take when planning and then pushing out your Real Estate Brand. 1. Evaluate The Competition. What niches are currently being exploited in your local market? Is there a high-end specialist? A condo expert? 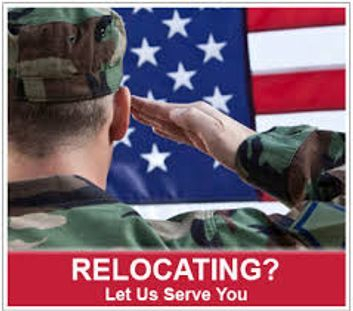 A Military Relocation Professional (MRP)? A low-cost leader? A “green” Realtor? Someone who sells mainly golf communities? Knowing what marketing angles your competition is pushing will help you see opportunities to market your own business in a unique way. It’s always important to ensure that your branding is not confusable with that of your competition; the last thing you would want is your prospects mistaking you for them when they are ready to pick up the phone and get started with a transaction! And knowing what is currently working out there may give you an idea as to what people in your local market respond to, which never hurts your cause. What is your core demographic? Can they be narrowed down by age, gender, family status, or profession? What Real Estate services do they need? What services are the most sought-after? Are there any services that a premium is put upon? What neighborhoods that you serve are the most lucrative to do business in? Would it benefit you to brand yourself around those specific markets? What specific advantages do you hold over the competition? Some Real Estate agents brand themselves around a signature service that they provide. What are the values of your company? Branding around morals and ethics can instill consumer confidence in your Real Estate business. Do you rely primarily around referrals for your business? This can influence your branding decisions at the very least and can even be the driving force behind your brand in some cases. 4. Put A Look To Your Brand. In the online marketing world, some key demographics are heavily influenced by visual appeal. So hire someone reputable to design an appropriate, unique logo for your business name. You should also consider creating unique logos for your signature services (or products if you have them). Once people become accustomed to your logo’s elements (the color scheme, the shape, and words contained within it), they will start to associate qualities to your brand. So that’s why it’s important to make that visual impact right off the bat in a way that’s easily memorable. You may want to think of some types of imagery that are popular in your local market and create your logo with a similar theme. 5. Deliver Your Brand! Once your Real Estate Brand is complete, you need to do everything you can to push it out into your local market. Every phone call should be answered with your branding in the script. Your print materials, including stationary, business cards, postcards, and home signs should proudly display it. Then spread your brand throughout your online presence; from websites to blogs, from social networking profiles to email blasts… they should all have language and visuals (logos) that reinforce your brand. And consistency is key here; promote one slogan and one signature logo. That will impress a similar message to all you communicate with, and remember, exact repetition of your brand over time is what delivers your brand through offline and online channels. Why Would You Buy A House From Yourself? If you can’t answer that question, it’s time to work on your Real Estate Personal Brand. People choose who they do business with based on a number of different factors, including presentation, demeanor, experience and passion. Your brand combines your beliefs with your business practices and this is what people gravitate to when seeking out a Real Estate Professional. 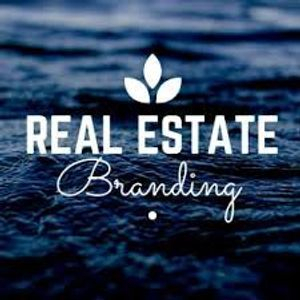 We work in Real Estate, so let’s get specific about how to make your mark on Real Estate with your personal brand. Anything other than the real you won’t work. Discover exactly what makes you fascinating. Build your brand on your true strengths. As a Real Estate Professional, your goal should always be to attract clients who identify with you and your abilities. The same skills you have at building friendships can be utilized to build trust with clients. People make decisions every day in the industry based on gut instinct, and insincerity just won’t work. Blurry brands languish. Define your brand with a focused niche to connect with the minds of those you aim to influence. If you’re having trouble clarifying your message, bring it back to the basics. 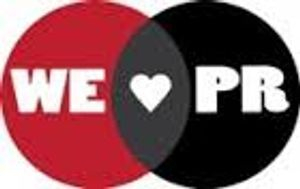 Why do you love Real Estate? People? Your town? Great architecture? Try to remember the first reason you got into this field. Or think about the first sale you made. Use those emotions to drive your messaging. Your brand should be the promise you make. Work at developing a unique selling proposition and express it in a concise, memorable slogan. Real Estate is an evolutionary, exciting, personable market; why did you choose to become a part of it? These are all integral questions you should be able to answer honestly and easily. Condense these ideas down and sum them up with one sentence — this is your slogan. People remember how you made them feel. What you say is important, but how you say it is even more important. Develop a unique and genuine voice. Are you a quirky individual that comes across as stiff in your writing? Do you sound genuine in person and forced online? Are you an older professional trying to make connections with younger clientele? Try to use language that is true to how you speak, and make sure that it sends the right message to your clients. Nix the notion of universal appeal. Take strong stands on your ideals and voice your opinions. There’s no notoriety in bland land. Be Bold. A sale price is a bartering ticket waiting for to be debated, so use all of those skills you’ve acquired in a “fast on your feet” business and tell it like it is. Feel free to say how you feel about market trends and neighborhoods. Your customers will appreciate the blunt tactics that bring effective results. Weak brands focus solely on intellectual arguments. Strong brands tap into emotions. The subject you need to master is psychology. Become a student of it. People buy houses on based on feelings and what it will do for their personal lives, not just property stats. Dig deep and try to comprehend emotionally what the people you are selling to are looking for. Adjust your strategy accordingly. Your face must appear all across the social sphere. Don’t scrimp here. Hire a pro to do a photo shoot and pick the portrait that says, “I’m your friend.” A personal brand is heavily based on visuals. Find a picture that drips with confidence and friendliness. Post it all over your social and make it your visual signature. If you don’t have one, hire someone to make you look great. Valuable content has magnetic power. Create an interesting mix of content to earn the mindshare and trust your brand needs. After you decide who you are, share what you know. Your content is the key to conveying that message of your brand. Choose to share insightful knowledge. Use interesting content to challenge the status quo of a classic industry. Don’t forget to ask questions: Ask your audience for their ideas and input. Everyone who’s looking for new homes can benefit from a expert comment or two. Ask questions. 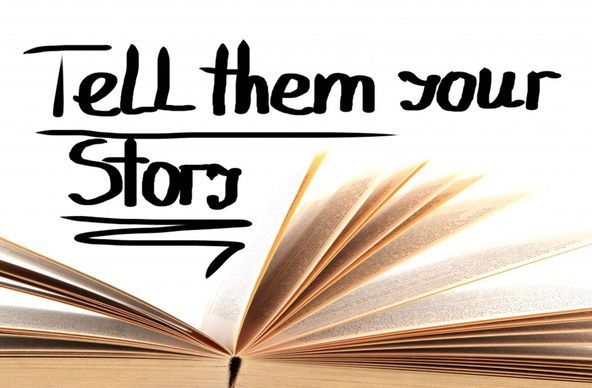 Ask people to tell you their stories. Ask for their ideas. And then listen closely. Everyone loves a good listener. Questions can be drawn from every corner of your life, whether that’s in person or online. Listening to people’s Real Estate needs or past experiences (good and bad) can help you grow your knowledge base of potential client do's and don’ts. Social is a great resource for potential new business strategies and content. Listening can be the difference between finding properties a client “likes” to signing papers. When surfers go to Google, which words will lead them to you? Build a short list of the most relevant keywords and use them often. Pick out some relevant keywords for your business area. Decide which words from your website and social pages have the most traction, and integrate them appropriately into your content, pages, and social media. The phrases you choose should accurately describe your business but also who you are as a professional. Media is more complex than ever, and more vital. Identify the outlets that are most valued in your field, and use their tools to elevate your brand. Social media and multimedia channels and Press Releases are the best way to get your messaging out there quickly and creatively. If you’re message and ideals are constructed properly, it will enhance your brand. If you aren’t getting interviews or spotlights from major media, build from within. Hire a video production team or take some tips from video experts and make some impressive content to share. Video is also a great piece of content to share on social media. Everything you create should be presented with class and continuity. Develop a tasty logo, color palette, and design standards that reflect well on your brand. Design is a crucial piece of making your brand message sing. Remember to compose a striking logo that translates the qualities of your slogan. Consider getting a pro on this one: The more professional your designs look, the more weight your brand will have. Make connections locally, regionally, and globally. Have a business card or something of even greater value to distribute, such as a Press Release. Follow up and follow through. Use social media to reach out and connect with new business partners and potential clients alike. But don’t focus on just business. Make sure that people know and trust you and your brand way before they’re thinking of Real Estate. And when they do? You will immediately pop up in their heads as a reference to a friend or family (or perhaps themselves). Influential professionals have prominent friends. Seek out leaders. Surround yourself with them. Find ways to be of value to them. There is a world of Real Estate Professionals out there who have years of skills and knowledge to impart. Seek out those who you can make you better — it’s the best way to become a leader. Affiliations are all-important to the growth of your brand. Find groups you’d be proud to be a part of, get involved, and make your presence known. Join as many business affiliations as you can. This includes professional groups and organizations, conventions and conferences. These are great ways to learn industry secrets and insider knowledge through workshops and organic conversations. Make a point of having one-on-ones with people you find interesting. Keep business cards on hand. Every person you admire taught you valuable lessons. Commit to nurturing the teacher within and build your brand by becoming a trusted advisor. Pull up the next generation of Real Estate Professionals by offering your knowledge to them. Being a trusted expert in an industry is a luxury and a privilege. Start to build your network of great Real Estate Agents and Brokers. You won’t achieve your goals on your own. Privately and publicly, recognize the contributions of every person who’s played a part in your brand development. Most people don’t wake up wanting to show properties for a living. Who were the influencers in your life that shifted the winds of change towards your current career? Recognize their contribution to your success. Something as simple as a mention in an interview, a tweet of thank you, or a simple card are all gracious responses. Your X-ray for all online efforts is analytics. Deploy Google Analytics and/or additional tools to inform you of how visitors behave on your site and what you can do to improve their experience. Are people going to the pages you want them to? Are they clicking on your prioritized links? Are they getting to your website via the keywords you anticipated? Look at your online analytics to inform yourself on how your audience is realistically interacting with your brand. You may consider adjusting your branding tactics based on these responses. Don’t wait for opportunities to come to you. Find ways to be helpful. Be the first to volunteer, connect people, or get behind any meaningful mission. Not everything is business. Your brand is still very much who you are, and people respond well to those who put themselves out on a limb to lend a helping hand. Always be thinking of how you can do things selflessly for the sake of a cause. Zeal is a “strong feeling of interest and enthusiasm that makes one determined to do something.” Without it, there’s no point in building a personal brand. This is something that should come naturally if you’re passionate about your work and your brand. Channeling this energy will make the difference of new and exciting business opportunities!!! Real Estate Agents: Put Public Relations to Work For You!!! Historically, in the Real Estate Industry, the work of Public Relations has mostly been pursued by the corporate offices of big brands. Agents and smaller office groups usually don't put a strategic focus on this important facet of branding for many reasons. It could be a cost issue, a manpower issue or a lack of understanding about just why Public Relations efforts are important. Working on your own Public Relations efforts are part of an overall personal branding strategy and it's a crucial piece of the puzzle. Did you know that Barbara Corcoran credits her success to her relentless PR efforts? She used the power of Public Relations to compete against giants like Trump and sold her company for $70 Million dollars. Success in this area is not outside of your reach. Ensuring that your name is synonymous with Real Estate knowledge and community support is paramount to creating a brand that is seen in a favorable light. Ultimately, if done correctly, long term public relations efforts will set the stage for an endless stream of business. The keys to being successful in your Public Relations efforts depend on two things: consistency and relationships. You must be consistent in your quest to get your name out there. You can't make an initial attempt and then forget about this important focus when you get busy. Forging relationships with targeted media outlets is an important step in the process. Building relationships takes effort and as such will take time to cultivate. 1 - Identify the media outlets you wish to be highlighted in. Identify both local outlets, like your local newspaper including online newspapers and also identify Real Estate Industry focused outlets. Getting quoted in a story in your local paper will show the people in the area you serve that you are a valuable source of information. Getting quoted in a story that is published in an industry outlet, like Inman news, creates credibility on a larger scale. The larger the audience of the outlet, the more credible you become. Think about it ... Getting your name associated with a story on a highly trafficked industry related site will not only give you credibility but will get your name in front of agents countrywide, which can lead to referrals!!! 2 - Start reaching out to the writers, publishers, editors and reporters of the outlets you have identified. Don't just introduce yourself but tell them why you are a great source for any Real Estate related information. Once a month send a personalized email with some tidbits they might find interesting, or story ideas. Even if you don't hear back right away, keep it up! It takes time and fortitude to make these relationships solid, so be consistent. Remember that while the goal is to get your name attached to a local story about Real Estate, you have to get there by giving these contacts relevant information that will make their job easier. 3 - Get involved in your community! Many agents do things all of the time that contribute to the wellness of their communities but often times don't tell anyone about it. Get a Press Release written about a cause that you are involved in. You'll get your name out there subtly through showing your involvement with the cause. If you've done a good job of getting the names of the editors and reporters of your local outlets, you'll have a great list to send your Press Release to. These tips are a great starting point in harnessing the power of Public Relations to build your brand. Know that many regional and national reporters scour local outlets to uncover news and good sources, so over time, and as a result of your consistent efforts, you may be fielding calls from reporters all over the place asking for your input and advice on Real Estate related stories. Good Luck! Along your SEO journey, you’ve most probably already encountered a Press Release. 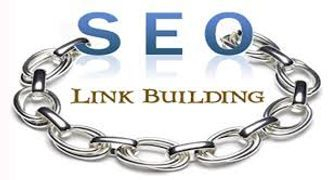 This link-building technique is usually a great way to attract links through other publishers and Press Release websites. And as you well know, other publishers and Press Release Websites can generate a lot of buzz – and they usually have good PageRank juice to boot! Again, the thing you need to start with is having a good, solid content that is newsworthy. Usually this content has to be fresh and new in your industry in order to spur interest with publishers. Always remember that in news pitching, you’re not just writing for any ordinary person. You are writing for publishers and other knowledgeable writers in your niche – who are usually as updated as you are! Obviously, having a content that can be considered a ‘fresh scoop’ SHOULD be worthy of attention and media coverage. Once you have established your newsworthy content, it’s time to spread the word. It is more strategic for you to publish your content on a Press Release website. Why? Because they have a good, established amount of readers – some of whom are publishers as well! ! And if they see that you are published in well known PR sites, they’re going to have an increased amount of respect for you. News sites usually have a “send a tip”, “submit news” or “contact editors” page linked somewhere in the footer – use this to submit your story if you think you have groundbreaking news in your industry. When pitching your story to news sites, paint your story in the most interesting way and don’t forget to cite sources (one or two of which should be a content in your website). Make sure you don’t have any grammatical error as you’re trying to be a reputable source of information. When you’re submitting your story, don’t use their social network accounts or email addresses to do so. They have their ‘submit news’ page for a reason – overriding it may mean that your story will not go to the editors or to the people whom you want to send it to. It is a must to have great, juicy information – so you will have to go out of your way to acquire data that is not widely spread. Publishing a story like this can gain links, interest, brand exposure and traffic to your website – especially if the content in your website is the main resource of the news scoop. Sometimes the fish you’re trying to catch when pitching in these news sites are the journalists who are using them for sources. There are several other websites that are available out there in order for you to do this. You can tip journalists and reporters and publishers directly by using News Sourcing sites. In pitching your story to news sites, you should also direct them to your content as you dish out the story or the coverage. These news websites usually provide a contact details form or some other way wherein you can reach the publishers when submitting a pitch. If you're in the market to buy or sell a house, chances are you'll want a Real Estate Agent to guide you through the process. Most people don't have the time, expertise or motivation to go it alone, and finding a good Real Estate Agent becomes essential to enjoying a smooth Real Estate Transaction. Here, we take a look at ways to find the best Real Estate Agent for your next home sale or purchase. While some may say it's easy to get a Real Estate License, it takes a lot of hard work and dedication to stay in business. The Real Estate Agents who make it, tend to have satisfied clients who send more business their way through referrals. Talk to your friends, family, neighbors and colleagues to find out who they recommend (and who you should stay away from). Try to ask open-ended questions that encourage full answers: instead of asking, "Did you like your Real Estate Agent?" try "What are a few things your agent did really well?" Find a Real Estate Agent who specializes in the market where you'll be selling or buying a home. Local experts are more familiar with particular neighborhoods, the local scene, schools, daycare facilities, Military Bases, VA Hospitals and other amenities, and will have a better idea regarding the prices that actually buy and sell homes in the area. In addition, local experts will have connections to other professionals and services in the area: Lenders, contractors, appraisers, etc. Ask the brokers-in-charge at several firms for their top agents where you're buying or selling, or look through local Real Estate Magazines to find agents who have a lot of listings in the area. This can get tricky since new Real Estate Agents aren't necessarily bad agents (they have to start somewhere, after all), but experience is often a better bet. Experienced agents tend to be better negotiators - getting you a higher price when selling, or a lower price when buying. Real Estate Agents who are very familiar with a market and who have closed a substantial number of deals are also better equipped to guide you through the process and respond quickly to any bumps along the way. Keep in mind that quantity doesn't always equate to quality, however, and consider: How close is the agent's average listing price to the sales price? How many price reductions had to be made? How many listings didn't sell? Technology is a vital part of modern Real Estate, both for buyers/sellers and agents. 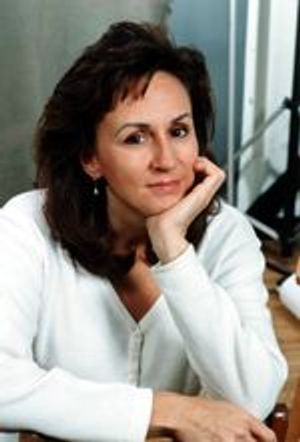 A good Real Estate Agent will use a number of tools to help organize and promote their business (thereby assisting you with your home sale/purchase), including contact management systems, agent websites, marketing software, Press Releases, electronic signature software and Real Estate Apps (e.g., House Hunter and Open Home Pro). Being connected also means that you'll be able to reach the agent - either by phone, email or text. Find out which tools they'll be using to help buy or sell your home, and how you'll be able to connect with them. The housing market moves quickly, so it usually pays to have someone who is a full-time Real Estate Agent working daily on your behalf. Full-time Real Estate Agents are generally more experienced and focused on getting the job done (and done well). In addition, it can be challenging and frustrating to schedule showings, meetings and closings around an agent's other job schedule. Find out ahead of time how much time/focus your agent will be able to dedicate to your home sale or purchase, and make sure their availability coincides with yours. Buyers and sellers now have access to much of the same property information that Real Estate Agents do (online and via mobile apps), and today's successful Real Estate Agents set themselves apart by being experts in a local market, a niche market, great negotiators, and staying connected, both to other professionals and through technology. If you're in the market to buy or sell a home, take the time upfront to find a qualified, experienced and professional Real Estate Agent who can help ensure your transaction goes as efficiently and favorably as possible. The Real Estate Industry has had some interesting ups and down over the past decade - NAR (National Association of Realtors) membership hit its all-time high back in 2006 with 1,357,000 Realtors before dropping dramatically with the housing financial crisis. However, since its rock bottom in 2012 (with 999,000 members), it has been steadily increasing, and with nearly 1,100,000 members in 2014, the competition among Realtors is heating up. While Real Estate Agents are still key in the home buying process, buyers are increasingly looking to do more leg work online before involving the experts. A study from the National Association of Realtors showed that 92% of buyers use the internet to begin their house hunting quest, driving home the vital need for Real Estate Agents to have an active online presence. If you're not active, engaging, and networking online, then you're missing out. 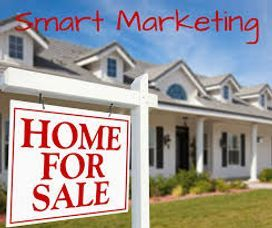 Here are the 35 best Real Estate Marketing Ideas for those looking to win the Real Estate Marketing Game. Make sure you have Social Media accounts on all the big networks (Facebook, Twitter, Pinterest, Google+, and even Instagram if you snap a lot of house pics). Interact with users, Share Good Press, and promote yourself and your properties. Put your contact info on every page of your website. Ideally, make an impressive contact us page that grabs attention. Create an awesome Press Release about yourself and make sure everyone you know, or come in contact with, has a copy of it! You can e-mail it, hand it out at open-houses and give it to everyone you meet, just as you would a business card. It's very impressive, You should also upload your Press Release on your website and Social Media pages. In many ways, you’re not just selling a house, you’re selling a whole town or area. Showcase the best that your area has to offer, with high-quality, beautiful photos of local town landmarks, videos and familiar sites. Consider producing an ebook like “X number of things new home owners should consider before buying” or “X most valuable features of a new home.” Offering free ebooks in exchange for an email address (and zip code, in the case of Real Estate) is a great way to capture leads. Successful Real Estate relies heavily on great photography. Bad photos will diminish interest in even the greatest of properties. It’s absolutely vital that you have gorgeous photos of your properties and yourself!!! Hire a professional photographer (preferably with experience photographing homes and architecture), or, if you have sophisticated equipment and are confident in your abilities, have your own hand at it. Just remember this is one of those scenarios when it pays to bring in the professionals.,There are tons of great resources that provide in-depth detail about Real Estate Photography. person. Virtual tours are a great way to give a comprehensive, accurate preview of the property for potential buyers. getting you and your business a spot on t-shirts, program pamphlets, or flyers, ballpark banners, etc. be super sophisticated, but it's important to have one. Board for a single property that, in addition, to property photos, highlights major benefits of your area. friendly. Even better, consider creating a mobile app that potential buyers can use to review listings. about upcoming open houses, new houses on the market, news about seminars you’re offering in the area, etc. (Note: if you work in different geographical areas, you’ll want to segment your newsletter subscribers based on their location, ensuring that they only get relevant emails and updates from you). depending on where they are in their journey. account makes it easy for users to find you in Google Search, Google Maps, and Google+. in regards to a specific niche need can make you memorable, especially in saturated zip codes. stories – tell a good one and clients will flock to you. your website! Click here some more tips on putting together a great webinar. has tons of great targeting features that ensure you’re only paying to get noticed by your key target audiences. feature for local publications. You don’t want to be blatantly salesy – today’s consumers don’t like to be pitched to. is doing well, or list the reasons why your regional area is becoming more popular (maybe it’s the revitalized downtown area or improved school system). be worth its weight in gold when they’re ready to shop for a home. branded goodies at local festivals and events to spread your brand. on their paper placemat setting. Don’t be afraid to get creative with local partnerships. strategically on your website and sharing them now and then on social networks. buyers Googling online for homes in your area. 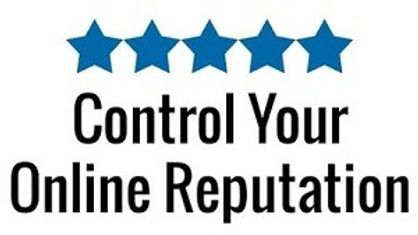 allows users to review Real Estate Agents, so put on a smile and rack up that rating, as a solid star rating will greatly increase your leads. down on the endless back and forth timeslot swapping. hopefully they’ll share your info with friends, family, and acquaintances who might consider moving in the future. Send a local care package to clients after they close, with local movie or theater tickets, restaurant gift cards, etc. clients anniversary cards, holiday cards, etc to stay fresh in their minds. When they have a friend who is ready to buy, they’ll pass along your info. Provide incentives for past clients to refer you to future homebuyers. people use the phone when trying to find a Realtor or make an appointment to view an apartment, condo or house. Once you’ve established a strong online presence - one that includes a fully fleshed out website, consistent content creation, and a savvy social media strategy - it’s time to turn your attention to other Real Estate Branding efforts to support this digital marketing foundation. Promoting your business through blog posts, social shares, and email campaigns is a vital component of any successful Real Estate Marketing Plan, but it’s not always enough to draw attention from the right audience. However, there is a way to break through to a new level of brand recognition — using community outreach to maximize exposure, specifically through a Real Estate Public Relations (PR) strategy, which we explain how to implement below. Before explaining how you can get your Real Estate PR Campaign off the ground, let’s examine why it’s worth your time to pursue this tactic. There are many benefits for brands in using Public Relations to enhance their visibility — many of which are applicable to you, the agent — but these are the primary benefits to consider. You can get assistance in gaining exposure for your Real Estate Brand. No one gets to where they want to be professionally without a little help. Sometimes, it comes in the form of a reference from a former colleague that helps you land a job. Other times, it’s a referral lead from another agent in your market. Similarly, when it come to Public Relations, you can leverage other people (journalists, TV/radio personalities, industry influencers, bloggers) and publications (newspapers/news websites, magazines, weekly/monthly newsletters) to become a recognizable agent in your community. While it typically takes time to develop a solid PR Strategy that generates buzz around your brand and positions you in the light you want leads to see you in, sticking with your community outreach plan in the long run will bring about numerous distinct benefits for your brand. Think of it this way: Just as persistence is required to “win” with your Real Estate Search Engine Optimization (SEO) Strategy, the same holds true for building mutually beneficial relationships that yield more acknowledgement of — and, if done right, high praise for — your company and you can develop relationships with sources who have large followings. Speaking of relationship-building, it certainly comes in handy to have connections who can regularly publish and promote your content and help introduce your Real Estate Brand to an entirely new audience. The trick to building bonds with Writers, Editors, Reporters, Publicists, and other Media Professionals is learning what you can do for them in return. The biggest benefit you can offer publications, blogs, and other digital channels is Name Recognition that will generate traffic for their sites and, in turn, advertising revenue. This means having an extensive online presence is paramount: The more fans and followers you have, the more likely you are to appeal to publications, podcasts, radio stations, and similar outlets who can share your information and content. Over time, as you develop close relationships with those who work for News Outlets, respected blogs, and similar entities, you will notice big changes in your Real Estate Marketing Analytics (assuming you track all external brand mentions closely and routinely). Additionally, you will also likely notice that people recognize your name and that of your company. Some people may know you from the local newspaper where you were quoted regarding home buying trends, a community charity event you sponsored, or perhaps a similar promotional endeavor you undertook in previous months. That’s the power of Public Relations: It helps you publicize yourself and your brand in ways that support your digital marketing foundation and lead more people to check out your online presence who haven’t done so before. It takes effort to gain exposure both offline and online (with the latter taking slightly more importance given the age we live in), but these “bonus” marketing efforts can generate lots of traction for your business that may otherwise never come about without some savvy outreach. If Public Relations is the icing on the cake, your overall Real Estate Marketing Strategy is the cake itself — each layer representing a different component of your online presence: your website, email campaigns, social accounts, guest postings, promotional videos, etc. Without all of these elements, a real estate PR Plan will do you no good. It’s not enough to get your website set up — it needs to be routinely improved. Once these pages have been built, you have the necessary collateral to justify spending time, energy, and money ramping up your Public Relations Efforts and, in turn, putting a magnifying lens to your digital body of work. 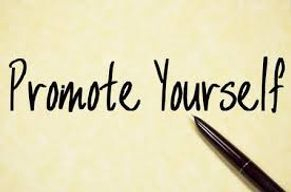 Promote your own content through email, social media, and other channels regularly. Offering your Real Estate Knowledge and expertise to local news services and getting your housing research syndicated on business blogs in your market are tremendous methods for plugging your business and getting more clicks to (and leads from) your website. Having said that, this should only be put into action once you take care of the core promotional tactics you can conduct on your own time — especially through email and social media. 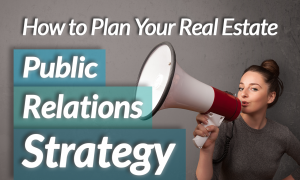 With your primary, day-to-day Real Estate Marketing Plan in place, you can turn your attention to Public Relations activities. There’s no one way to do PR — it’s all a matter of need and preference. The one place to start planning your PR strategy, though, is with outreach. When you first began your career as an agent, you likely created a mission statement that outlined, at a high level, what you aim to achieve in Real Estate Sales. One of the chief tasks any professional with a PR strategy should undertake is to create coherent, to-the-point boilerplate language for use in Press Releases and by media who will need a description of your brand should they mention you in their content. Create a similar statement that relays your value proposition and what distinguishes you from other agents. Be As Personable And Relatable In Your Press Releases As Possible To Earn The Trust Of Resources. Just as you present your services and sales history to potential seller clients during listing presentations, it’s ideal to be down-to-earth and relaxed when pitching stories to news outlets, blogs, and the like. The stuffier and staler you are with your proposal, the less likely your contact is to be receptive to your ideas and requests. 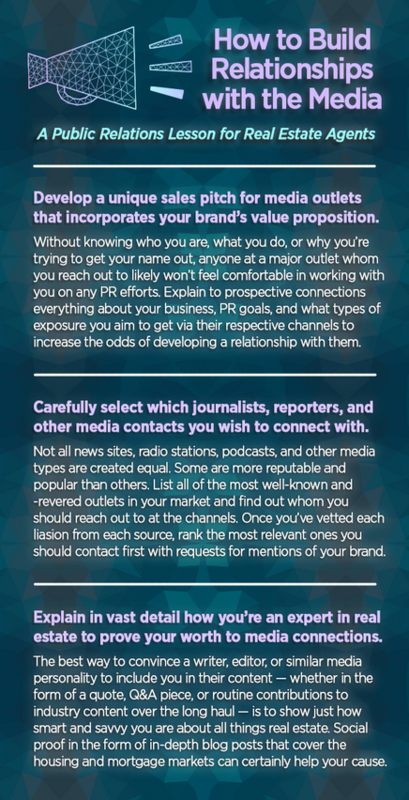 If you’re unsure of how to get your foot in the door with PR pitches for stories, brand inclusions, and quotes, not to worry: Sites like Help a Reporter Out (or HARO) make it simpler to connect with the right Real Estate Publications and other sources that pertain closest to your area(s) of expertise. If you’re a busy Real Estate Agent, your inbox is filled to the brim with email from past and current clients, top-of-the-funnel prospects, bottom-of-the-funnel leads, colleagues, bosses, and other connections. That means it’s pretty difficult for someone you don’t know to grab your attention and make you click on a message, right? Now put yourself in the shoes of a media member with the same dilemma: Are they more likely to open an email with the subject line “I have a GREAT opportunity for you! Click here!” or one that’s personalized to them and piques their interest? At the end of the day, the most enticing reason for Writers, Editors, Producers, and those in similar Media-Based Positions to use you as a source in a News Report, Press Release, Feature Article, or other content is your expertise and knowledge of all things Real Estate. Constantly learning on the job and gaining new certifications and designations through the National Association of Realtors and other industry resources isn’t just something that can help your bottom line — it can also help prove you can be extremely useful to those producing content around Real Estate. In your communications with media connections, express the specific, intricate aspects of Real Estate in which you are most knowledgeable. It’s this attention to detail that can lead to them choosing to incorporate your voice and thoughts in a piece of Press instead of another local agent. Personalization in email subject lines legitimizes your brand and increases the odds of recipients opening your email, so spend some time crafting short subject lines that boost your chances of getting your messages read and responses from persons of interest. Of course, email is just one touch point, as mentioned, but nonetheless, this is imperative if you ever want to build long-term relationships with the media and prominent personalities online. Even as recent as the early 2000s, the need for Real Estate Agents and other professionals to leverage external media professionals to build brand awareness through tactics like Press Releases and interviews was high. Real Estate Industry Members simply didn’t have the resources or know-how to get mass exposure by themselves. Times have changed and now it's time for you to get out in the world and make yourself and your brand known to the world! Building a reputable Real Estate Brand starts and ends with being omnipresent, so while the (overwhelming) majority of your marketing time and energy should be spent in front of your computer screen, don’t forget to fill in the gaps, so to speak, with offline promotional activities like these. As noted above, fine-tuning your on- and off-site SEO efforts is an absolute must if you want to bolster your Real Estate Branding. Your website: It’s what makes success in search engine results pages (SERPs) for organic marketing possible. Some agents may not consider these activities related to Public Relations, but that’s exactly what they help with: getting your brand name better-known on the internet and by the right audience searching for primary, secondary, and long-tail keywords pertaining to your housing market. We live in a digital world. You’re probably reading this on a computer or mobile device, which is probably also where you get your news. Being in the news is great - and it gives you a stellar reputation. Newspapers are still a vital part of our media culture, and Newspaper articles are powerful tools for Real Estate Sales. People get their news everywhere online. They go to online Television Stations to read their news and Real Estate news sites for Real Estate information. They read their news on Social Media news sites, Military news sites and Business News sites - millions of people are online everyday - reading their news online. 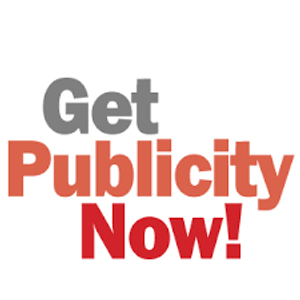 Publicity for Real Estate now seeks to build NAME RECOGNITION for the Real Estate Agent, and draw the potential client into making contact with you. Public Relation (PR) Agencies promote their clients, their services and often, their stories. But unlike advertisers, they persuade their external or internal audiences via earned methods. Whether it’s the traditional media, social media or speaking engagements, they communicate with their audiences through trusted sources. To help the general public understand Public Relations and how to use these skills, and for those in the industry who need to explain their jobs to their grandparents, the occasional stranger, and friends, here are a few things everyone should know about Public Relations. They create narratives to advance their agenda. PR can be used to protect, enhance or build reputations through the media, social media, or self-produced communications. A good PR practitioner will analyze the client, find the positive messages and translate those messages into positive stories. Public Relations is earned media. This means you convince reporters or editors to write a positive story about you or your client, your candidate, brand or issue. It appears in the editorial section of the magazine, newspaper, TV station or website. So your story has more credibility because it was independently verified by a trusted third party. Another huge difference is price. PR firms charge monthly retainers or can be hired for specific projects. Advertising can be very pricey. A former client purchased one full-page ad in a weekly magazine that cost him $125,000. He expected a wave of phone calls, viral media and multiple conversations about the ad. He got zero. In contrast, getting quoted in the New York Times, Forbes and Reuters resulted in national speaking invitations, calls from new and existing clients, and solid credibility. Not everyone can afford $125,000, but advertising can be expensive when you figure the cost of the space or time plus the creative designs and production costs. And most advertisements need to be repeated several times before the consumer can be influenced. Because it’s in their best interest to sell you more ads, advertising folks tell clients what you WANT to hear. “Baby you’re the best! You just need to pay for a few months more for billboards and TV spots!” Because PR people deal with image enhancement and creation of long-term relationships where your story often must be accepted by others (the media) before you obtain recognition, PR people tell clients what they NEED to hear. Marketing mavens have been talking content marketing and “becoming a media company” for years. At Inman Connect San Francisco, Gary Vaynerchuk proposed the “digital mayor” strategy. And in 2017, more Realtors will be creating written, video, and visual content than ever. Why? Content adds value to homeowners. 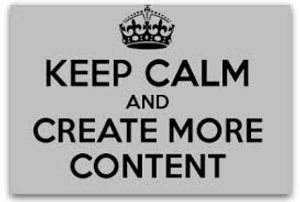 Content is one of the most effective methods of generating organic traffic to your website. Content generates organic (low cost) leads. Content can be used to qualify prospects. Content is, as it has always been, king! Now, search engine optimization (SEO) and search engine ranking place (SERP) for Real Estate is getting tougher because of all this content being created by your competition, both small and big. Google’s latest algorithm changes clearly prefers sites that have useful content for their users. This means you simply cannot rank as well with a normal MLS-listing-based website. Why? Because Zillow and Realtor.com are already doing that, and their massive database will always outrank you. Furthermore, Google’s algorithm is expected to get a lot smarter in 2017 with big changes expected in the area of local SEO. However, smart marketers realize that you don’t need to have thousands of views per blog; you only need your target audience to see your content. 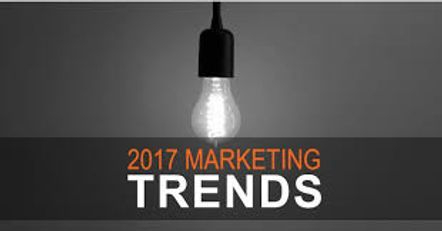 Therefore, the next trend will be to create more content marketing with a very specific target audience and making sure they know who you are and why they should hire you as their agent. In 2017, devote your time to content marketing because it will be an absolute necessity to make yourself stand out from the competition. Advertising and lead-generating is temporary, but to build your own brand as the go-to Real Estate Agent in your community, you need to adopt some sort of content marketing strategy. The Military Market you reach is 100% employed. The Military Market is not affected by the tides of unemployment and it is a stabilized market segment; no recession, no pay cuts, and no unemployment! Where can you reach millions of young, family-oriented consumers with high rates of disposable income? In the U.S. Armed Forces. The often-overlooked Military Community includes more than six million Active Duty Personnel, Spouses, Children, Volunteers and Civilian Employees. While I’m known internationally for my war photography, it's the Veterans Portrait Project (VPP) where I now focus my lens. I began the VPP as I recovered from combat injuries sustained in Iraq. After spending hours in VA waiting rooms surrounded by Veterans from every generation and branch of service, I was compelled to honor and thank them in the only way I know how, photography. 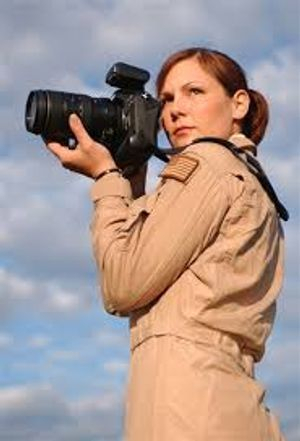 Since taking my first portrait in late 2008, I’ve conducted more than 100 portrait engagements, traveled to 65 cities in 27 states and captured over 6,000 Veterans' portraits to date. My goal is to capture portraits of Veterans in every state and province from which the United States Department of Defense recruits. The Veterans Portrait Project began as an emotionally cathartic, physically healing tool. I’d committed my life to my country and when I could no longer serve in uniform, the VPP became an extension of my service. My new mission is to share the unique stories of Military Veterans and honor their service in a unique, creative way. Each Veteran receives a complimentary, high-resolution portrait they can share with friends and family. Their portraits and stories are also included in national printed exhibitions, showcased in video productions and shared via social media, thus ensuring their contributions to American Military history are never lost. There she is again, staring back at you from that "Ask the Expert" column in your local paper. Once again, that agent is building trust and familiarity with prospects that should be yours. What's more, she's dispensing Real Estate advice that you could have penned with your eyes closed. Why does she have all the luck? Answer: She doesn't. Luck has nothing to do with it! Nor does the right-place/right-time myth. Publicity only comes to Realtors, and Brokers, who make it happen. 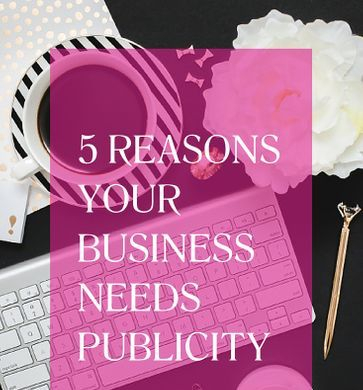 Unfortunately, publicity is often overlooked as a key marketing tool to gain attention and interest in a service or office. Using publicity as a sales tool can be a much more effective method of generating sales than buying advertising, because people assume they'll get objectivity, and useful information, from articles, columns, news stories, radio and TV interviews, how-to pieces, and the like. Fortunately, today's technology makes massive publicity affordable for Real Estate Agents. Participate in any of hundreds of Publicity Opportunities that increase your image, services and awareness.